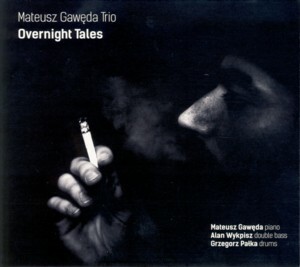 This is the debut album as a leader by young Polish Jazz pianist / composer Mateusz GawedaFind albums by this artist, recorded in a classic piano trio format with bassist Alan WykpiszFind albums by this artist and drummer Grzegorz PalkaFind albums by this artist. The album presents six original compositions, all by Gaweda. Gaweda´s arrival on the Polish Jazz scene created a lot of buzz and genuine interest, not only due to his flamboyant expressionism, but primarily as a result of his obvious talent and fresh, innovative input to the Jazz idiom, easily noticeable even on the dense and competitive local scene, which is bursting with talent. I had several opportunities to watch him performing in the last couple of years and my immediate reaction was always full of genuine appreciation. 2016 proved to be a breakthrough year for Gaweda, with several excellent albums with his participation being released, including this debut wrapping up the proceedings of an extremely busy year. As all great Jazz musicians, Gaweda is first and foremost unique in his approach to composition and the instrument. Surprisingly the music on this album is the most "conventional" performance by Gaweda that I have heard so far, which is a great revelation. There is very little of the Avant-Garde experimentation, which his live performances usually emphasize. That does not mean of course that the music is "conventional" in any sense. In fact it is anything but conventional. Based on beautiful melodic themes, the extended pieces allow the pianist to venture far away from the basic melody and explore uncharted territory. Not Free Jazz per se, the music incorporates a large degree of space and freedom, which allows for tempo changes and intense climaxes within the duration of each of the tunes. There is a wonderful natural flow, which keeps the music moving forward, seemingly effortlessly in spite of its complexity and dramatic mood swings. The rhythm section is perfectly cooperative with the leader, staying respectfully in the background in order not to collide with the delicate piano sound, but filling the spaces, both harmonically and rhythmically, just in the right spots. Wykpisz is steadily earning a position of a leading bass player on the Polish scene in the last few years and the young Palka is still earning his dues. Both of them do a great job here and Gaweda made the right choice to have them on the album. It will take several listening sessions, even for the more experienced listeners, to fully appreciate this album. This music, like good wine, takes time to mature and settle in, best explored at ease and in perfect concentration. Since Gaweda is surely going to emerge as one of the major players on the Polish Jazz scene in the years to come, fans and lovers of Polish Jazz should give this album the time and the respect it truly deserves. This is definitely a very impressive debut, which hints as to the gift Gaweda is blessed with. Perhaps decades from now people will remember it as a classic, which introduced Gaweda to the world? Definitely one of the most important Polish Jazz releases in 2016. Respect!